Liverpool are not looking to sign Borussia Dortmund star Christian Pulisic in the January transfer window. Reports on Friday claimed the Reds had tabled a £45million offer for the American international with Jurgen Klopp said to be keen to bolster his attacking options further as the Reds close in on Premier League glory. However, Klopp is not interested in bringing in any reinforcements in the January window and hasn't sanctioned a big-money move for Pulisic. 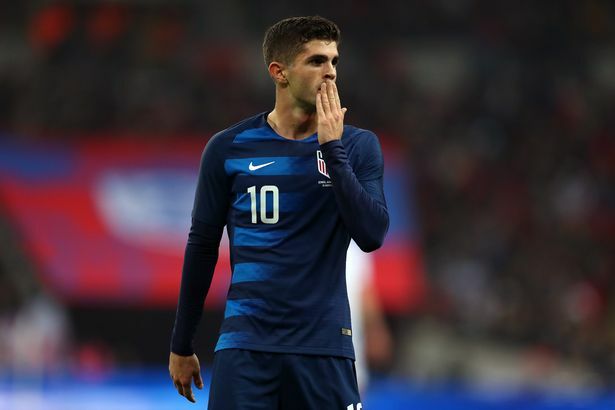 The ECHO understands Pulisic hasn't been identified as a potential signing in the New Year, with Klopp happy with the options at his disposal at present. Liverpool are currently top of the Premier League by six points and the Reds manager doesn't see the value in pursuing a move for Pulisic this season. The Dortmund youngster has history with Klopp, having been brought to the Bundesliga by the German back in 2015 as a 16-year-old. Klopp tried to sign the gifted young winger two years ago at Anfield but saw an £11million offer rebuffed by Dortmund who viewed Pulisic as an important part of their future. However, the 20-year-old has not been integral to Lucien Favre's plans this term with young English talent Jadon Sancho emerging as a breakout star for BVB instead. Pulisic's contract at Dortmund expires in 2020 and the USA star is said to be attracting the attention of Chelsea and Arsenal. Liverpool however, won't be entering the race in January and Klopp is not expected to delve into the market at all unless he suffers an injury to one of his key men. "I'm very happy with what I've got, but you don't know," he said earlier this week. "That's why I always keep the door open, in case something happens and we need to have a look. "There are a monstrous number of games coming up and as long as we can react, it's all good. "If something dramatically changes, we'll look. If nothing happens then I'd say we will not do anything." Wolves are 2-1 up at Wembley. We now need to do our job! Wolves doing Liverpool a bit of a favour today. That’s taken the pressure off a bit but it also underlines just how big a win here is for the Reds. That’s an unbelievable scoreline from Wembley. I don’t think Spurs have got the depth to seriously last the pace in the title race anyway but in their current form they had to be regarded as dangerous. It means Liverpool will go nine points clear if they beat the Gunners tonight. It’s finished 3-1 to Wolves at Wembley. Arsenal are matching up to Liverpool with something like a 4-2-3-1. There was a suggestion they’d go 3-4-3 but seemingly not. Aubameyang likes a goal so the further away they keep him from Alisson Becker, the better. Arsenal are pressing high and are also looking to play out from the back. This could be one for the high Liverpool press.